I remember my mother saying that February wasn’t good for anything except reading a book. I’ve adopted that same philosophy, but expanded it to include January and March. Gloomy winter days and cold dark nights are especially conducive to knocking titles off my To Be Read list and moving them to my Books Read notebook. I’ve been listing books since 2004. There are enough pages in my notebook to keep recording titles until 2059. I’ll be 100 years old. I like to plan ahead. The Magnolia Story by Chip and Joanna Gains — their love story and their rise to fame. They have somehow stayed humble and appreciative. Inspiring. Nathan Coulter by Wendell Berry — the first of Berry’s “Port Williams” series of stories. Wendell didn’t know it would turn into a series when he wrote this. I’m glad he kept going. Watch For the Light: Readings for Advent — this compilation of readings continued into January. It was nice to extend Christmas through Epiphany. Jane Eyre by Charlotte Bronte — somehow I made it through sixteen years of education without reading this book. I listened to the free audio version by LibriVox, complete with Elizabeth Klett’s English accent. The Art of Slow Writing by Louise De Salvo — I’m a slow writer. Now I know it’s an art. The Guernsey Literary and Potato Peel Pie Society by Mary Ann Shaffer and Annie Barrows — purely for fun. So delightful. I wanna go to Guernsey. Jayber Crow by Wendell Berry — my heart just swelled typing this title. Oh Wendell. I wish you could come over for dinner and talk about Troy and Mattie and Burley. And, of course, Jayber. I came across this quote while I was rereading “A Severe Mercy” (by Sheldon Vanauken), which makes me a real lover of books, evidently. For the past thirteen years, I have kept a list of all the books that I have read. In 2013, I read twelve books. That was the year I got my iphone. In 2015, I read 55 books. That was the year I got over my iphone. This quote got me wondering. Of the hundreds of titles on my list, how many had been worthy of a second read? Surprisingly, there was a handful. I really don’t like to watch movies I’ve already seen. I don’t care to listen to the same album over and over. and I just have to open the pages. In June, I wrote about my son-in-law’s Christmas gift to me — reading four books together in 2016. The first two books were a resounding success so we each made another pick. My second choice was “A River Runs Through It” by Norman Maclean. It’s a story about a fly-fishing, Presbyterian minister and his two sons. If you’ve seen the movie, you will picture Brad Pitt standing in the river, casting his line, on every page. But that’s ok. Because the writing is so captivating, even Brad Pitt takes a back seat. Dan’s second choice was “A Severe Mercy” by Sheldon Vanauken. I’m just a couple chapters in so the jury is still out. Dan and I will talk it over at Thanksgiving. I am reading “The Closer” to PB. 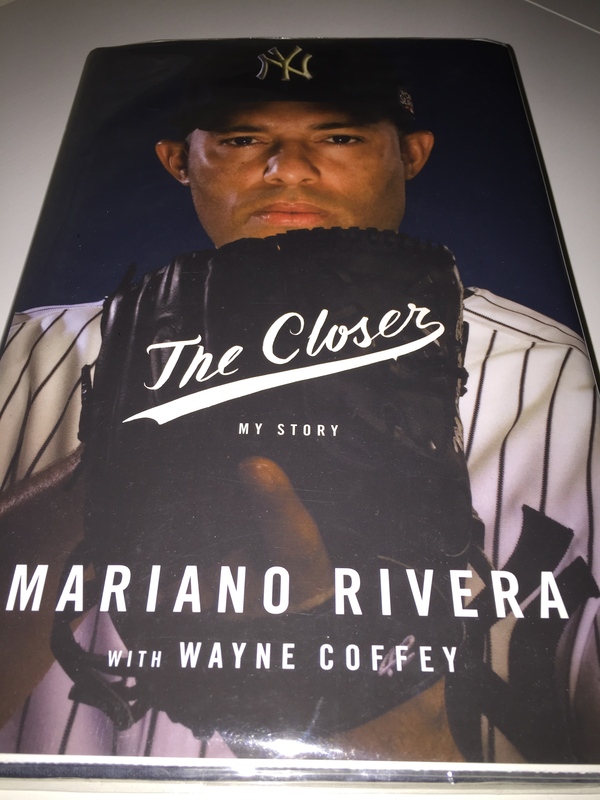 It is the story of Mariano Rivera, the New York Yankee pitcher who is MLB’s all time saves and ERA leader. For those not familiar with baseball lingo, that means he is the greatest relief pitcher of all time. If you’re still in the dark, Rivera was the guy who came out to the mound in the ninth inning to get the last three outs in a close game. His role was to finish off the game and keep the lead, hence the name, “The Closer”. 1. Rivera was poor kid from Panama, who played baseball on the beach with a glove made out of an old milk carton. His humble start in life kept him appreciative every step of the way. 2. I don’t hate the Yankees anymore. Although the book tells about their many World Series victories, he talks as much about the many play-off games they lost. The insider look at the clubhouse and the dynamics between the players revealed that most of them were very close friends and not money-hungry narcissists. I said most. 3. When Mariano signed with the Yankees, he didn’t speak any English and didn’t realize his signature meant he would be getting on a plane and flying to America. He was terrified of flying and always held his Bible on his lap when in the air. 4. All throughout the book, he gave God the glory for everything that took place. His faith was strong, but not flashy. PB and I think that’s good advise for life. Lord, help me not overcomplicate things. Drown out the noise that plays in this world that fills me with doubts. Help me to just do the best I possibly can with what You’ve given me. Some days I’ll feel like a loser. That happens to everybody. Give me the grace to let it go and move on so I don’t take yesterday’s failures out to the mound today. Amen. For Christmas last year, my son-in-law, Dan, gave me a truly creative gift. He offered to read four books with me over the course of the coming year. One of my favorite things to talk about with Dan is books. He was an English Lit. major and has an appreciation for good writing, so I corner him whenever they visit and pick his brain about all things books and reading. I chose the first book. In January we read “Peace Like A River” by Leif Enger. It’s a great story with fascinating characters, but it was Enger’s writing style that drew me in on page one. I haven’t had the best of luck with fiction, so I felt like I hit a gold mine with this book. If you are ever standing in the fiction section of a book store and come across “Peace Like A River”, read the second to last chapter. It will take you about eight minutes. I’ve perused Enger’s words many times and they always move me. Better yet, buy the book, take it home and read the whole thing. Dan’s first pick was “David and Goliath” by Malcolm Gladwell, which we are reading together now. I thought it was appropriate to use my “Mark the Bookmark” bookmark in honor of Goliath. Gladwell’s book looks at “underdogs, misfits and the art of battling giants.” In the introduction, he points out the many ways Goliath was disadvantaged in the show-down with David. Most Sunday school versions of the Old Testament story make Goliath out to be the easy champion and David’s unlikely victory the surprise ending. Now I’m rethinking all that. Perhaps David had the odds on his side from the very start. Maybe being the underdog has its advantages. Once Dan recommended a book to me and I read it, but didn’t love it — until I talked it over with him and he pointed out all kinds of things I had missed. Then I realized that I did love it. Discussing “David and Goliath” should make for some interesting conversation with my son-in-law. I’m learning that talking over a book can be as powerful as reading it. Sometimes when I read a book, I come across words that work so well together I just have to open my college ruled spiral notebook and copy them down. Then I revisit those words from time to time and let them work on me. This collection of quotes and excerpts has grown over the years. I figure there’s no sense in letting them pile up in a stuffy closet. Hence, this series of Wednesday Words. I’ve finally discovered a way to slow down time. Fast from something for 40 days. My, how the days do seem to drag on. For Lent this year, I chose to give up reading. At first it was nice to have quite a bit of extra time to do other things. But now I’m getting antsy — longing for the feel of a book in my hands. 1. It’s good to have a chance to be alone with my thoughts. When I grab a book every time I have a few minutes (or hours) I’m continually cramming information into my brain. It all gets squished in there and I can’t differentiate between my thoughts and the notions of the five authors I’m reading. I was pleasantly surprised to find that, given a little space to breath, I do think my own thoughts. 2. There has been a feeling of empowerment with denying myself something I assumed I needed. I can look at my TBR pile of books and say, “You’re not the boss of me.” I can drive by the library and gloat, “You have no hold on me. (Or holds for me.) ” I can click out of Amazon and resist the urge to hit “Buy now with 1-Click”. I can. 3. Limiting my reading to only one book (the Bible) has made that precious time delightfully sweet. My eyes are more eager in the early morning hours to open the pages and soak in the words. I’m paying attention better, staying more engaged and falling in love with the words of life. 4. I am learning that I can do without things and it’s not really that hard. What seemed like a lofty and admirable plan on Ash Wednesday, quickly showed itself to be small potatoes. Coffee, chocolate, Facebook, spending money, reading — those things aren’t as big a deal as we think. We could live without any of it and survive. 5. Reading lots of books had become a source of pride for me. I’ve kept track of every book I’ve read over the last twelve years and adding a title to that list was puffing me up a bit. Or maybe a lot. I don’t know who I thought I was impressing, but I didn’t see it for what it was until now. 6. Now I know what it’s been like for PB all these years when he’s wanted to go to sleep and I’ve kept the light on to read. It’s so annoying. But I’m proud of my hubby – he’s read more than I have in the last month. 7. It’s been confirmed in my mind that TV is a wasteland. Outside of watching a few documentaries and basketball games, my only other go-to activity has been to go to bed. I’ve definitely gotten more sleep than usual. 8. On the scale of what qualifies as true sacrifice, giving up reading is pretty weak. It doesn’t come close to donating a kidney or falling on a grenade to save a fellow soldier. My little experiment pales in comparison with what this Lenten season is really all about. The supreme sacrifice will never be required again – my debt has been paid in full. My eternal future has been secured, not because I gave up reading for forty days, but because my Savior gave Himself up for the love of the world.